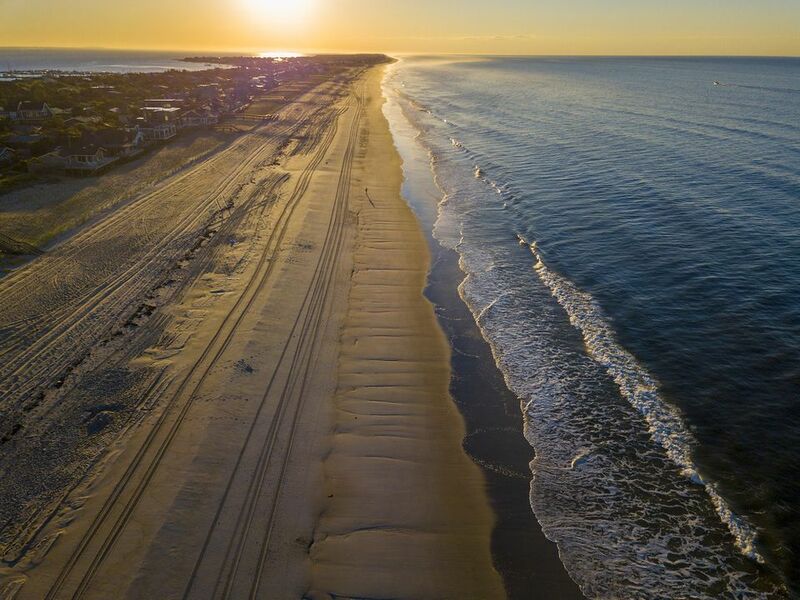 Fire Island, an Atlantic Ocean barrier island, sits off the southern shore of Long Island, New York. It's a popular outdoor recreation destination known for protected beaches and resort communities. Fire Island is home to Robert Moses State Park on the west end, Smith Point County Park on the east end and an eight-mile nationally-protected wilderness preserve. In the middle of the 31-mile island, accessible only by ferry, are 17 car-free communities—most of which are strictly residential with only a few offering shops and nightlife. With the exception of service and emergency vehicles, cars are not permitted to drive throughout the island. You can drive to either end of the island, but there are no paved roads between these two points. If you drive to the ends of the island you can visit the Fire Island Lighthouse from Robert Moses State Park and the Fire Island Wilderness Visitor Center. Residents and visitors who come to the island walk or bike. You can find the occasional golf cart, although Radio Flyer wagons are the way people haul things. In fact, you’ll find a red wagon parked at pretty much every house. Ferries access Fire Island from three Long Island towns: Bay Shore, Patchogue, and Sayville. If you are traveling to the largely gay communities of Cherry Grove or Fire Island Pines, your best bet is the Sayville Ferry Service. The ferry also takes passengers to Sailors Haven and Sunken Forest, within the Fire Island National Seashore, and the Fire Island community of Water Island. The Davis Park Ferry out of Patchogue goes to Watch Hill, a National Park Service site, while the Fire Island Ferries out of Bay Shore run to westernmost Fire Island. Ferry service is limited outside of the summer high season, but not non-existent. Off-season visits to enjoy a weekend of solitude or to shop for next summer’s share house are possible. You can reach Sayville via the Long Island Rail Road, departing from New York Penn Station. From the Sayville train station, take a taxi to the Sayville Ferry Service terminal. Taxis generally wait for arriving trains at the train station, so no need to call ahead. You can drive to the Sayville ferries, but note that parking spaces are hard to come by, especially during beautiful beach-weather days. Either plan a very early weekend escape to the beach or be prepared to hunt down hard-to-find street parking. Bus routes operated by Suffolk County Transit provide access to the park's gateway communities of Patchogue, Sayville and Bay Shore. You may have to walk or take a taxi to get from the bus stop to the ferry terminal. Bicycles are one of the primary ways to get around the island, but not the best way to get to the island since Long Island does not have designated bike routes. While on the island, be mindful of bicycle rules. For example, bicycles are not permitted in the Otis Pike Fire Island High Dune Wilderness area, on boardwalks, or other pedestrian walks at National Park Service properties, and may not be ridden around park marinas. Rules on bicycling on Fire Island depend on the community you visit. If you like hiking, you can walk to Fire Island from Robert Moses State Park, which is located at the westernmost end of the Fire Island landmass. You will first intersect Kismet, then Saltaire; Cherry Grove and the Pines are a ways to go beyond that.